I had never had a chance to take train across this scenic section of railway but had vivid memories of driving along the A9, which runs parallel to the railway, during a snowstorm. Near Druimuachdar Summit a large stag, forced down from the hills by the heavy snow, ran in front of my car. A few seconds later a BRCW Type 2, a refurbished class 26 to those of you not as old as me, overtook my car with a passenger train. Apart from those memories I saw little else as the snow bleached the landscape white. Perth station still retains some of its former grandeur. I was never fortunate enough to visit in steam days but have seen plenty of photos so much seemed familiar. Train sheds, wide platforms, substantial stone station buildings and an air of importance were all much better than my cynical mind had expected. Waiting on the platform were the usual variety of passengers plus a large contingent of cyclists with their bikes, a horrid pair of whingeing kids with their mum and a man with enough do-it-yourself materials to build a house including some large pots of paint and lengthy planks of wood. 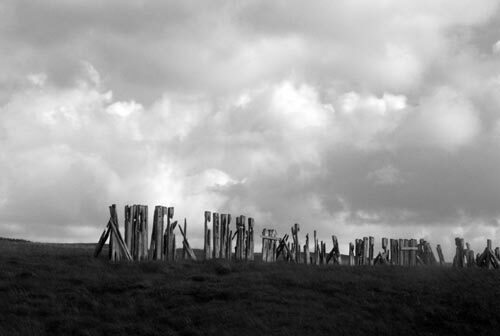 Photo - Dilapidated snow fences at Druimuachdar Summit which lies 1484 feet above sea level maing it the highest point on Britain's mainline railways. The train indicator suggested a prompt departure at 1718 and sure enough a First Scotrail 3-car Turbostar no.170406 arrived from Glasgow with ample time to cover the station stop. I am good at getting seats after many years of practice and sure enough managed a perfectly positioned window seat in the leading carriage. We left on time passing through what is now the standard urban clutter of modern housing estates and retail parks. A quick glimpse of the River Tay on the right with cars on the busy A9 competing on speed. Accelerating well, the train soon reached line speed and you felt that good progress towards the destination was been made. The railway is contained in a wooded valley and after twenty minutes we braked for the stop at Dunkeld & Birnam. With a strong Shakespearean connection the dark conifers of Birnam Wood seemed a perfect fit for Macbeth. Red Deer in the trees on the left, castellated bridge over the Tay and remaining with this great river, the brakes are applied for Pitlochry. Departing at 1752 we pass beneath the Atholl Palace Hotel with its Scottish Gothic style. We are on double track now as we head north under leaden skies. Cattle and sheep replace arable farming and the landscape is getting wilder with some big hills in the distance. There are remains of wooden snow fences on the left as we pass a southbound train. A big sign on the left says it all - Druimuachdar Summit 1484 feet above sea level - the highest point on Britain's mainline rail network. (Note that you may be more familiar with the anglicised spelling of Drumochter.) The train coasts past Dalwhinnie Distillery with its neat black and white buildings as we continue on single track once again. Further stops at Newtonmore and six minutes later at Kingussie lead us into a wide valley. Station signs pronounce 'alight here for the Cairngorms National Park' although sadly the landscape in these parts is overrun with dark, regimented conifer plantations. Still well loaded the train is full of business people or commuters in smart suits and armed with snazzy mobile phones and laptops. Some are off on their holidays with trainers, hiking boots and cycling shoes. The DIY man is still here obviously living far from a suitable source of materials in some quiet Highland glen. The screaming kids are still there - screaming! There is a family of 'hair aficionados' where mum, dad and the two grown up kids are all competing to win the prize for the most unusual hair-do! There are foreigners pointing and reading their guide books and there is me just happy to watch the scenery go by. Despite it being August there is still the odd patch of snow on the hills of the Cairngorms. Aviemore is reached - it's a lovely station with the preserved Strathspey Railway alongside. The catering trolley comes through the train again powered by a young East European lady - what a surprise! Looking back you can see Cairngorm rising to over 4000 feet with the great rocky ravine of the Lairig Ghru clearly visible to its right. Its 1858 as we leave Carrbridge to climb to Slochd summit at 1315 feet above sea level. We wait here for a southbound train, another Turbostar full of people. Just prior to the summit the track looked in a poor state with a severe speed restriction in place. No doubt Network Rail will have solved this by now. We trundle over the River Findhorn at Tomatin, with its small whisky distillery. A fly fisherman tries his luck, his olive green Land Rover parked on the riverbank. A deer runs across the tracks and disappears into the conifers. Another viaduct and back on double track. To the right lies the Moray Firth whilst to the left the high mountains of the Northern Highlands can be seen. We are arriving at Inverness quite rightly called the capital of the Highlands. We are on time as we screech to a halt at 1934. Alongside passengers are boarding the Inverness portion of the Caledonian Sleeper which will take then to London overnight. All that remains for me is to grab some dinner and find my bed and breakfast so I am ready for another day.